I’m always excited when something new opens in my backyard (the East), and Katong Square has recently popped up right next to I12 Katong, housing some pretty great eateries that you need to check out. 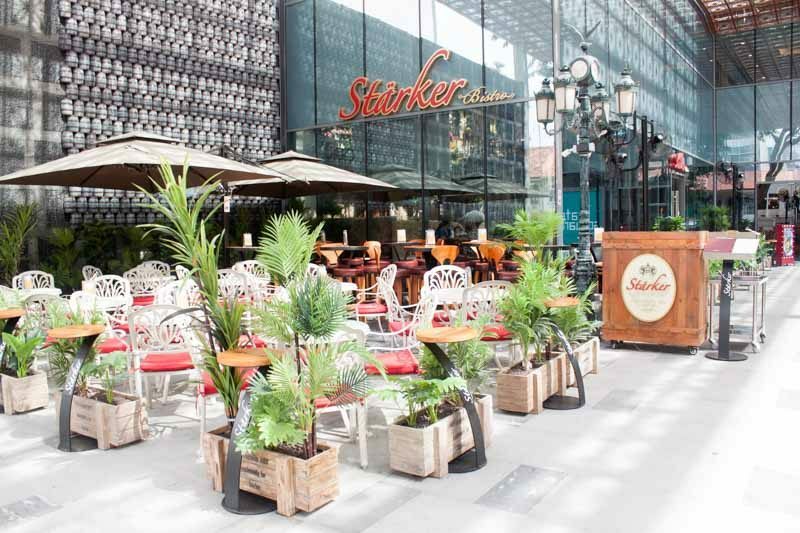 Starker Bistro certainly stands out with its latest outlet on the premises, featuring an inviting al fresco dining area and even prettier interior. 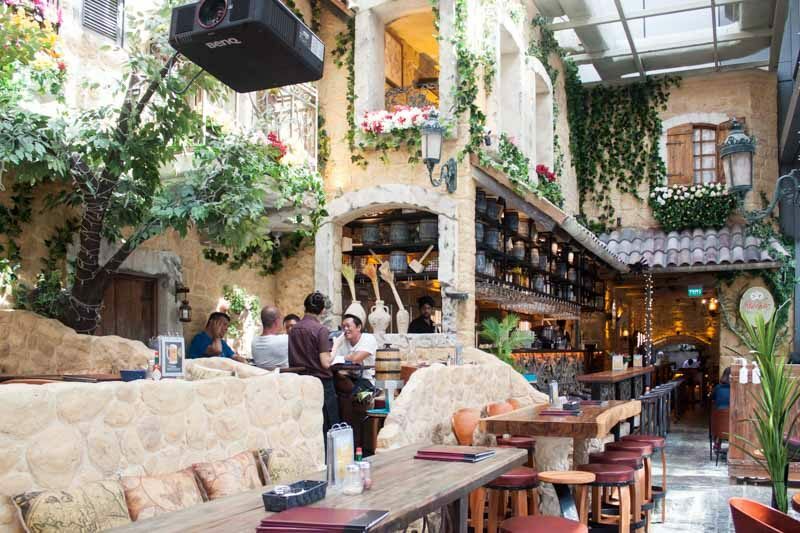 Stepping in, I felt like I was headed for lunch at a Tuscan villa, sunlight streaming through floor to ceiling windows. 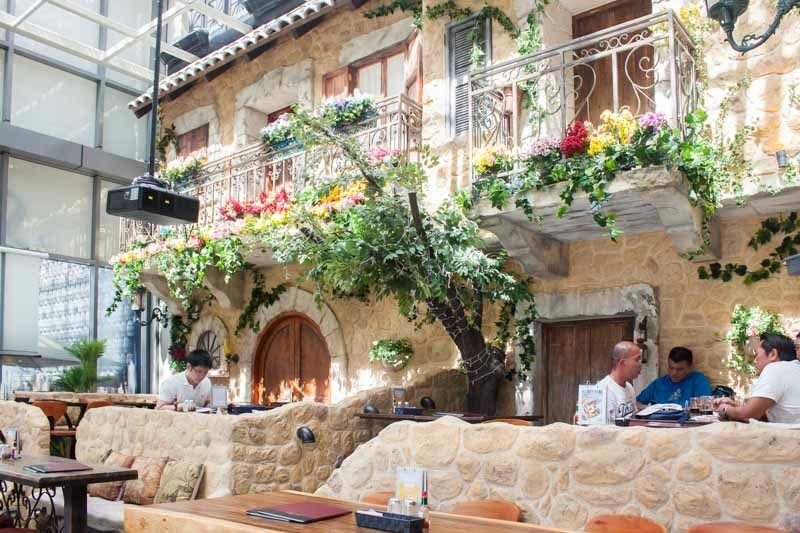 Flowers drape the low balconies overhead, and trees even provide “shade” to tasteful wooden tables that definitely maximise the space. All this while being in the comfort of air conditioning; I was automatically ready for snapping pictures for my Instagram. 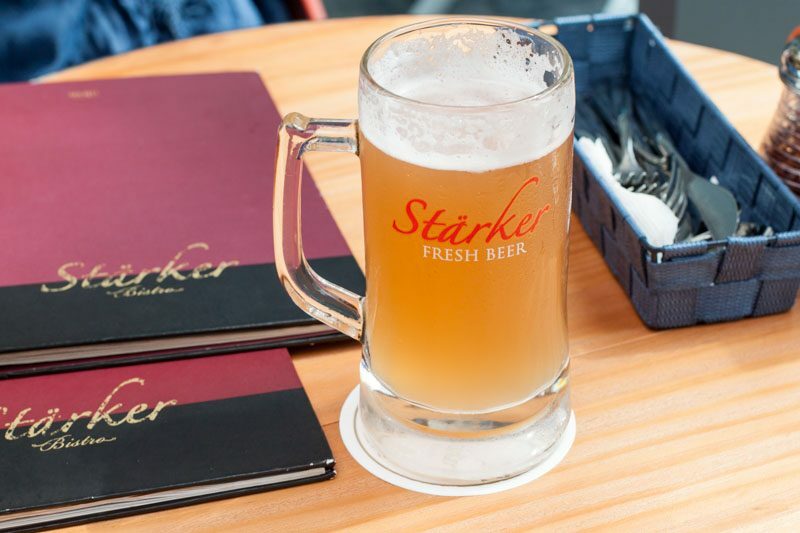 Starker Bistro is no stranger to the F&B scene in Singapore; it’s quite popular for its traditional way of brewing and drinking the Starker brand of fresh beer. I decided to go a little rogue and order a pint of the Starker Lychee (Happy Hour $12.90) and did not regret it one bit. Served icy cold, it was refreshing and light, with the subtle fruity lychee flavour lingering ever so slightly on the palate afterwards. I knew one was never going to be enough. Thank goodness for Happy Hour (Sunday – Thursday till 9pm, Friday and Saturday till 8pm) where you can also try the other fresh beers like the Lager, Aromatic, Dunkel and Charcoal. Beer and hot wings are always a good idea, so I was glad to find that Fiery Wings ($13.80) are a signature dish on the menu. Crispy chicken wings are coated with a spicy and tangy hot sauce and served in the perfect portion size for a starter or as a bar snack. Sharing is definitely optional. 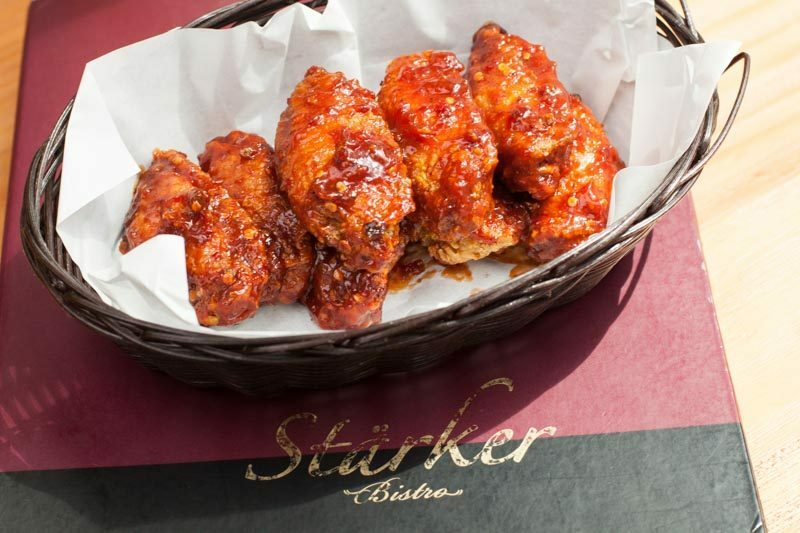 The menu at Starker Bistro is diverse, offering more of a fusion cuisine despite sounding like a German restaurant. 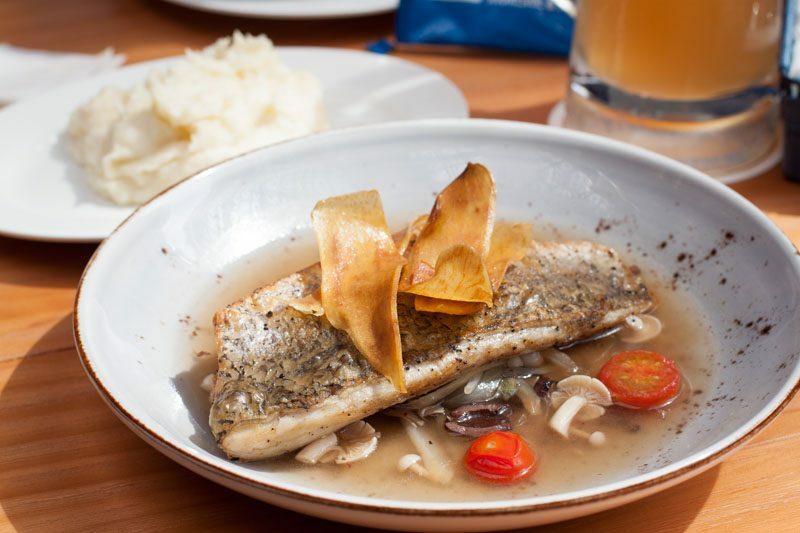 You’ll still be able to find German favourites on the menu like the Traditional Pork Knuckle ($38.80), but I decided to try some other recommended signature dishes like the Sea Bass Al’ Acqua Pazza ($22.80). A sizeable portion of sea bass came served atop an extremely flavourful broth of olives, capers, cherry tomatoes and shimeji mushrooms. I opted for a side of mashed potato, but that ended up pairing slightly strangely with the clear broth, so maybe go for the other choices of crisp fries or potato wedges instead. 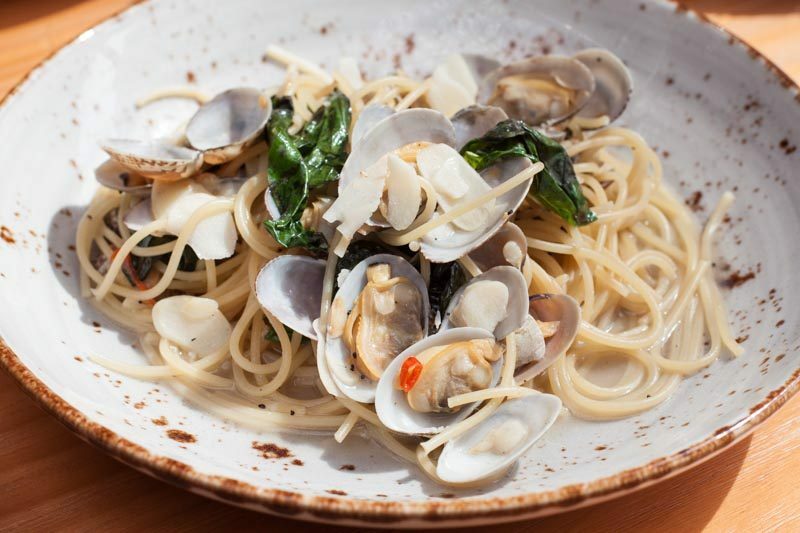 The pasta selection was very tempting and I settled on the Vongole ($19.80), another signature dish on the menu. I’m glad that it came served with quite a few white clams in sight, and as far as vongoles go, it was one of the better ones I’ve had. The balance of the white wine, garlic and fresh basil leaves worked really well with the meaty clams, and I loved the bit of heat from the bird’s eye chillies. 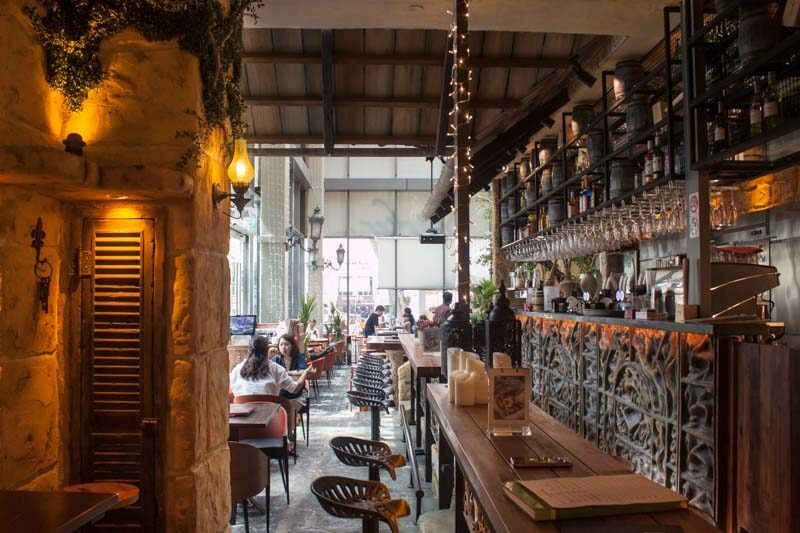 I admittedly came to Starker Bistro for the beer and to check out the amazing interior decoration at the Katong Square outlet but the decent food and service had me already planning my return. The ambience during lunch was amazing, and I expect an equally spectacular setting when they dim the lights for dinner. The best part? It’s open till midnight every single day so you know where to go for that much needed 10pm beer or two.